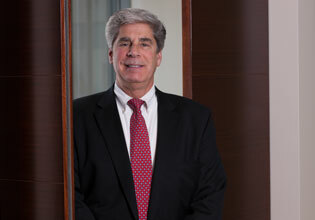 David Giangrossi is a courtroom attorney possessing more than 30 years of experience in diverse areas of litigation. Initially, he found his practice divided evenly between transactional work and family law litigation, but over time his focus shifted entirely to litigation. David's early experience as a transactional attorney enables him to resolve disputes and obtain solutions that equip clients to manage their assets, to meet their obligations and to prosper. His early handling of transactional matters, including preparing leases, mortgages, security agreements and business contracts, gave him a solid foundation for representing litigants. David is a creative problem solver, an articulate advocate and a tenacious adversary, whose goal is to assist each client in conflict with others through reasoned guidance. David has handled many issues through motions rather than at trial, often reducing damages significantly in the process. Marriage of Phillip A. Meyer v. Leanne V. Meyer – A divorce case, involving a client who suffered from a medical condition, which resulted in a favorable decision permitting the client to use proceeds of the sale of marital property to buy a suitably accessible home for her and the couple's eight children. Estate of Carrie Emerson West - At trial, David's representation produced a favorable court ruling directing certain family members to return a substantial amount of money to our client, who was elderly and mentally disabled. Myo Kinetic Systems, Inc., v. Hollister Incorporated – A case where David successfully presented a motion that reduced the damage claim for our client, Hollister Incorporated, from approximately $2.1 million to about $700,000. He also successfully presented a motion in limine to the court that further reduced the client's exposure for damages to about $191,000. Handling numerous contested probate matters in the Circuit Court of Cook County, involving such issues as admission of a lost will to probate, construction of an inter vivos trust, defense of a trustee against claims of malfeasance and surcharge, and adverse claims of executors, heirs and legatees. Prosecution of mortgage foreclosure on behalf of many financial institutions. Handling several appeals in the Illinois Appellate Court, First Judicial District. J.D., The John Marshall Law School, Chicago, Illinois, 1979. B.A., University of Wisconsin, Madison, Wisconsin, 1974. Martindale-Hubbell, "peer review rated for ethical standards and legal ability," since 2003. Village of Cary Planning Commission, McHenry County, Illinois, chairman, 1996 to 1998. Zoning Board of Appeals; Village of Cary, McHenry County, Illinois; member, 1992 to 2001; chairman, 1994 to 2001.